We started our day after a refreshing night in the Ben Muthu hotel in Tyndrum. An interesting hotel. Most other guests appeared to have arrived on two German coaches so we drank and ate in the company of roughly 80 Germans. This was fine until I settled into the Quiet Lounge which was not quiet as the evening entertainment, a Portuguese karaoke singer, started belting out ACDC numbers in the main bar next door and the Germans started joining in. A double whisky helped the author complete yesterday’s blog. As I write tonight’s blog I apologise if you do not read this until later on tomorrow. We are staying in the wonderful Inversnaid Bunkhouse which relies on satellite broadband which gets a little spotty when the mist settles (as it has). I had great hopes for this blog. 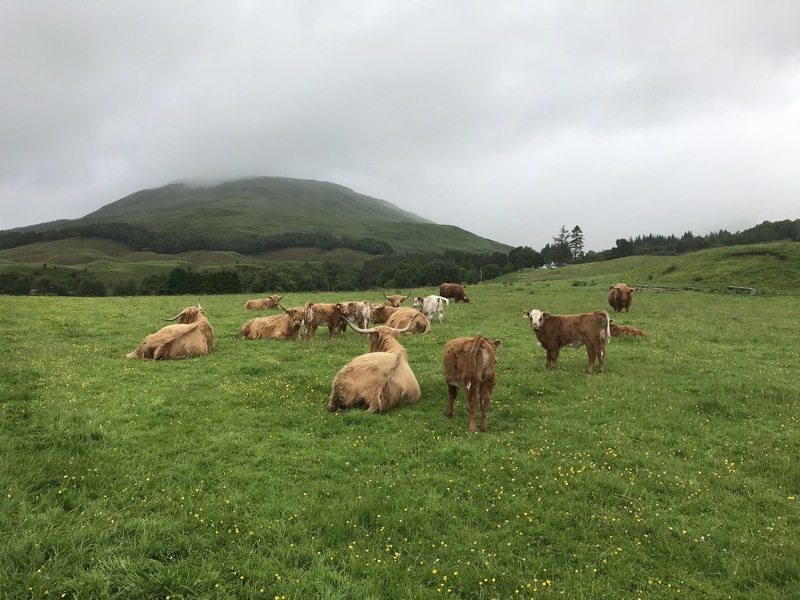 We had a lovely morning’s walk from Tyndrum passing a battlefield where Robert the Bruce fought a local clan days after being beaten in battle by the English. We walked past a ruined monastery, a beautiful herd of highland cattle and a flock of sheep and the wonderful, noisy and very busy Falls of Falloch – especially busy following the downpour yesterday. 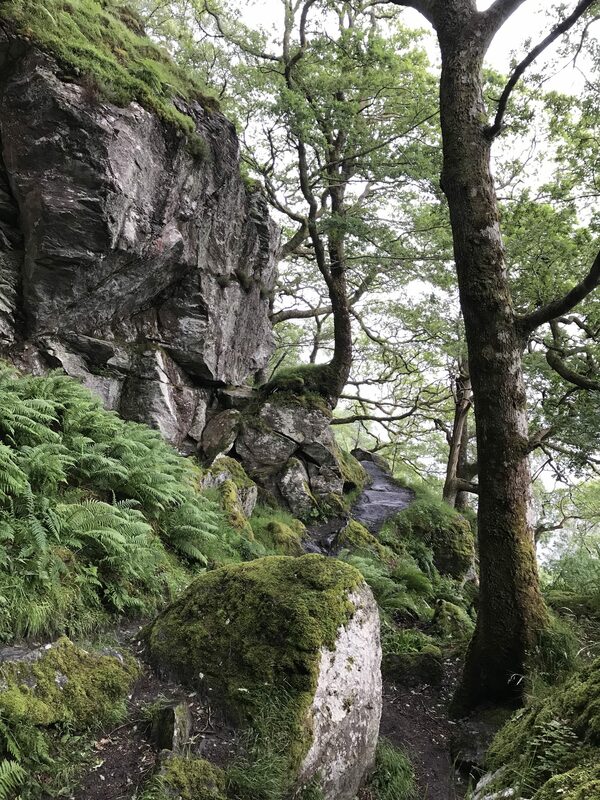 We encountered midges as we climbed over 300 metres through a beautiful forest and got a little wet as we walked through mist and a very British mizzle at the top. We went under roads and railway lines, crossed many, many rivers, in spate following the huge amount of rain yesterday. 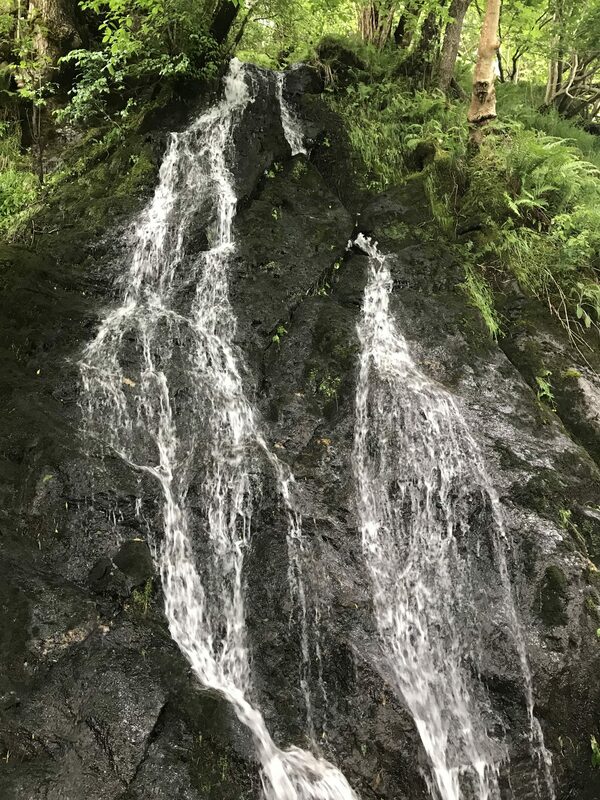 We even had the joy of Loch Lomond revealing itself to us, in all its beauty and magnificence, as we topped emerald green hills clad in ferns. Sigh.But no. This blog has to describe two things that happened today: firstly, people; and secondly, rocks. 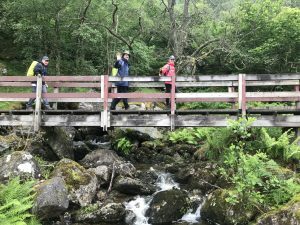 Having walked most of the Great Glen Way (generally a wider, better repaired path) and not really come across many walkers imagine our surprise to find a constant stream of travellers coming up the West Highland Way towards us. This led to much nodding, many “Hiyas”, “Hellos”, “Good mornings” and, when we guessed at a North American accent, a conversation. It also made us realise that we were travelling in the wrong direction! 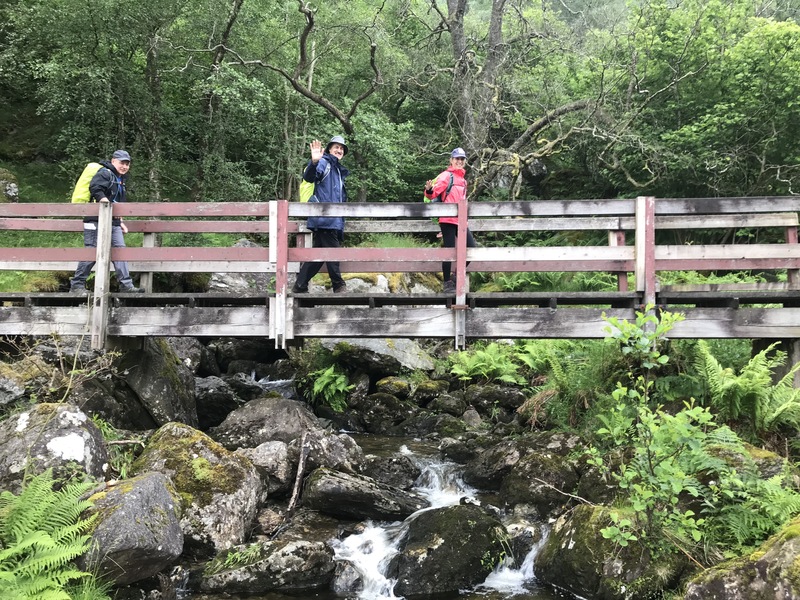 Along the way we greeted a number of American students starting their summer break with a leisurely stroll in the Scottish Highlands. We stopped and chatted to: a mother and daughter from San Diego (sorry we did not get your names); Julian (with his guitar) and Madelaine from Ventura, California; Andrew, Alex and Poe (21 months) from Washington D.C.; and Michael and Robena who were living (but not from) Toronto, Canada. 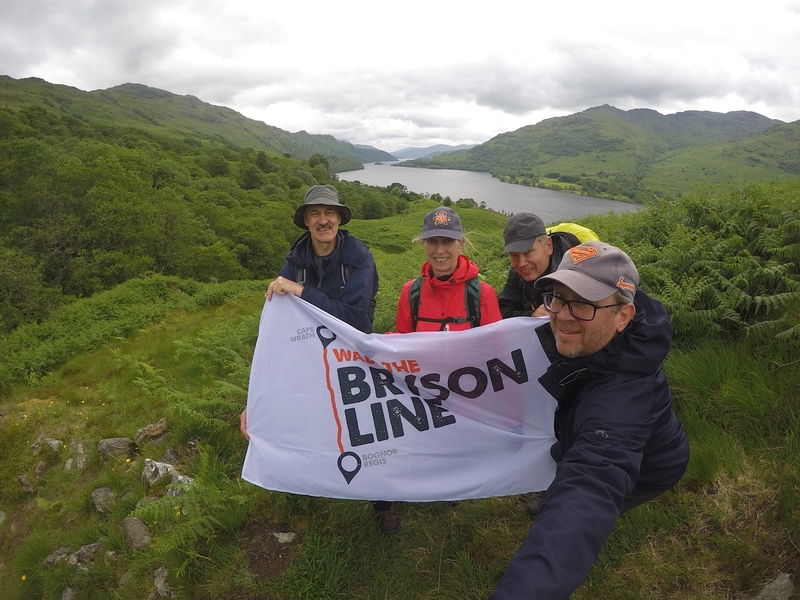 We met Barry from England in the forest (he knew who Bill Bryson was!) and towards the end of our walk we stopped to talk to a team representing the UN: Michael from Australia, Francois from France, Mitzi from the US and Bonnie from Hong Kong (apologies if any of that is wrong). It was huge fun and probably cost us more than half an hour in time but boy was it worth it! Rocks. The banks of Loch Lomond, far from being bonnie (please refer to folk song about high and low roads) were bloody rocky. We reached the famous, freshwater loch around 3pm and with 3 miles to go were confident we could be at our end point for 4 pm. No chance. No way Jose. After descending to the loch we started along the bank to discover the lovely compacted gravel path with the odd large stone however as we got closer to the water the path turned into a jumble of rocks and roots. If you have been bouldering you may be familiar with the concept of clambering – up, down, sideways, slipping, etc. To make it worse it started to rain. Our one hour jaunt home turned into a three hour scramble after we had already walked 17 miles. Four tired walkers arrived at the Inversnaid Bunkhouse (www.inversnaid.com) a little after 6pm and 20 miles from the start. Lesson learnt. In Scotland always expect the unexpected. ps. A mention for Tracey Macleod and her friend Nicloa who we met tonight. They are walking the West Highland Way as part of a plan to raise £10k this year to support their friend Zoe who has lupus (a disease we know a little about). Good luck girls. You can support them here https://www.justgiving.com/fundraising/tracey-macleod2.